One of the most relaxing things to do anywhere, is sit in a natural hot spring. 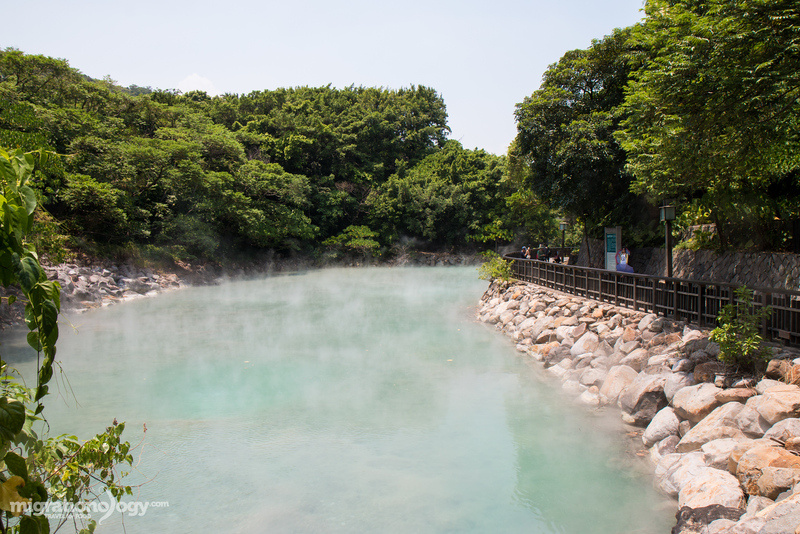 Located within Taipei city limits is Beitou, a natural hot spring recreation area in the city. During our stay in Taiwan, we decided to take a day trip to Beitou, enjoy the hot springs, a number of attractions in the area, and then of course, eat some food. 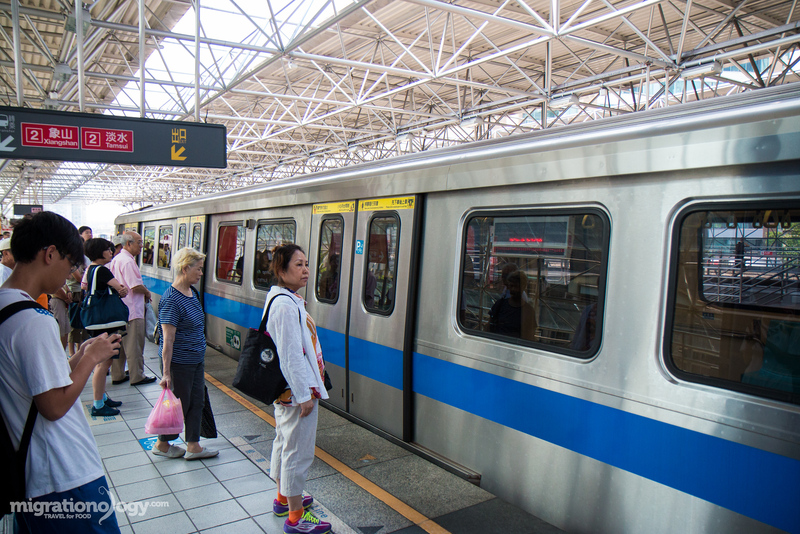 Taipei is one of the most convenient places to get around with its slick and efficient MRT Metro system, and getting to Beitou is no different. We were staying at a hotel in central Taipei called Homeyhouse* (highly recommended), and the journey took us exactly 30 minutes. When you arrive to Xinbeitou station, it sort of feels like you’ve transported yourself out of the city and into a countryside resort town in the mountains, even though you’re still in Taipei. 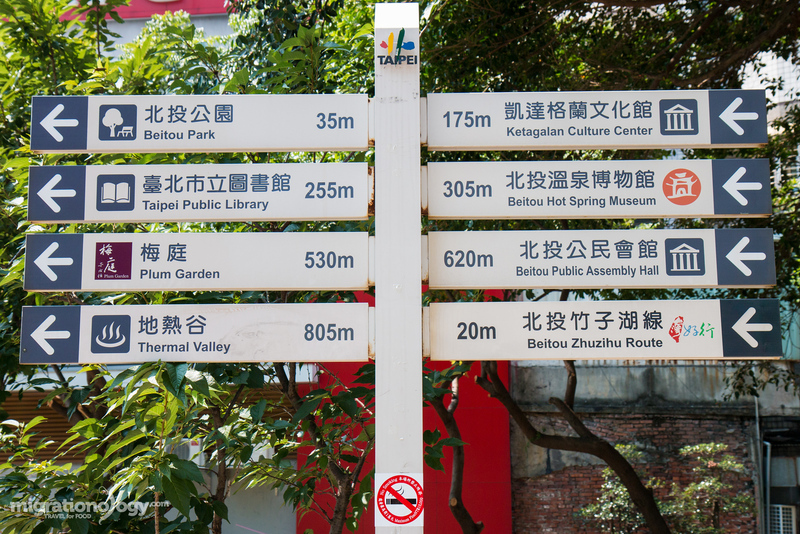 Conveniently positioned right outside the Xinbeitou station you’ll find a couple of full maps of the area, and the walking route you can take to explore the different attractions Beitou has to offer. You can snap a photo of the map with you phone or camera so you have all the directions in your pocket, then keep on exploring. But there are plenty of well marked signs and maps as you walk down the street towards the hot springs. 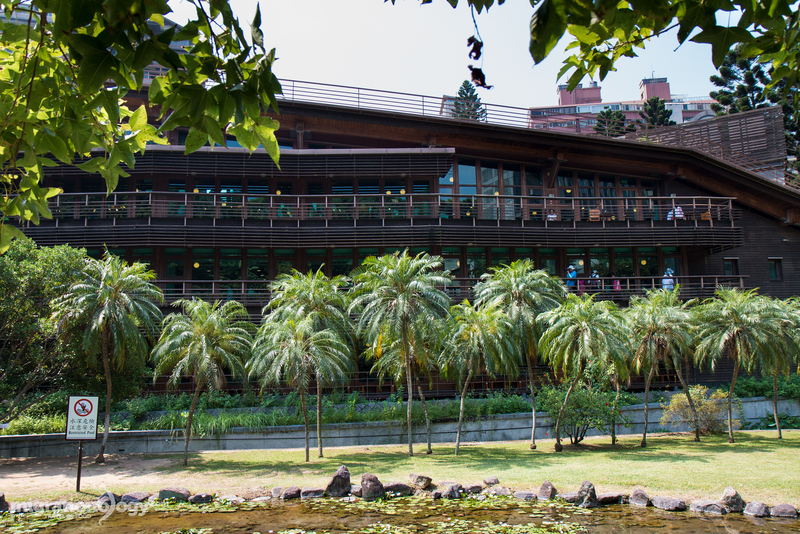 It’s not really an attraction, but the Beitou Public Library, which is fully in use, is a stop on the Beitou day trip route because of its beautiful setting and eco-friendly architecture. I only spent about 2 minutes at the library, but I did manage to take a quick peek inside, and get a view from the outside. However, you could spend some time there if you’re interested in a place to study, or read a book. What I did really like was the natural feel and green design. Across the street from the library I noticed the Ketagalan Culture Center, a museum about the local Taiwanese culture in the area. I didn’t go in, but if you’re interested in culture, it might be a good place to visit. 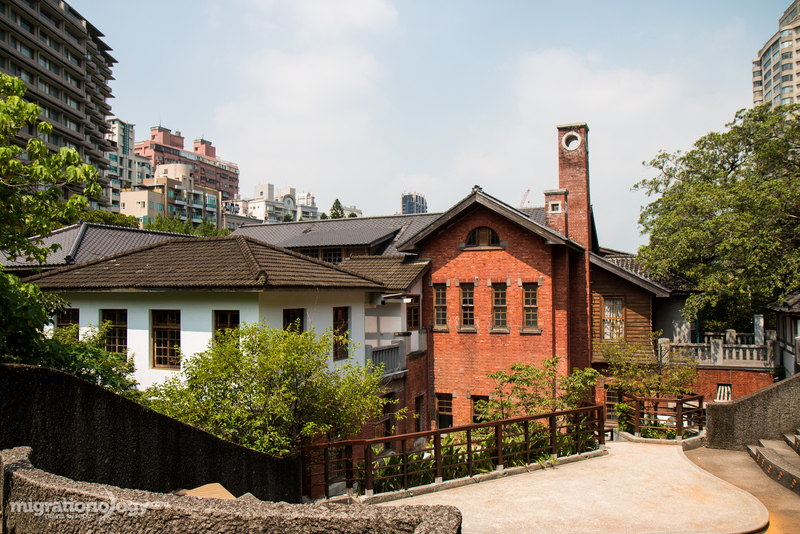 Just a 2 minute walk down the road from the library is the Beitou Hot Springs Museum. While walking down the road, I actually didn’t know it was the museum at first – I thought it was more like someones European cottage home. 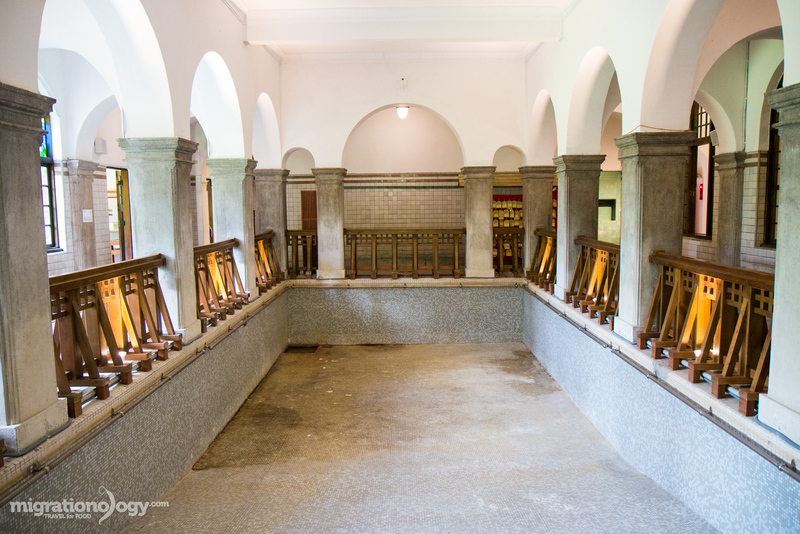 The museum, which is free of charge, was the original public hot spring bath in Beitou. Although built by the Japanese in 1913, the bath house was made with influence of British and Victorian architecture and design. From the outside, and from some of the rooms in the hot spring house, it really had a British feel, while other parts were very Japanese. When you arrive at Beitou Hot Springs Museum, they give you a pair of sandals which you have to change into in order to walk around the museum. From there, you can check out a few of the rooms, the main bath house at the bottom, and then a few gallery rooms as well. 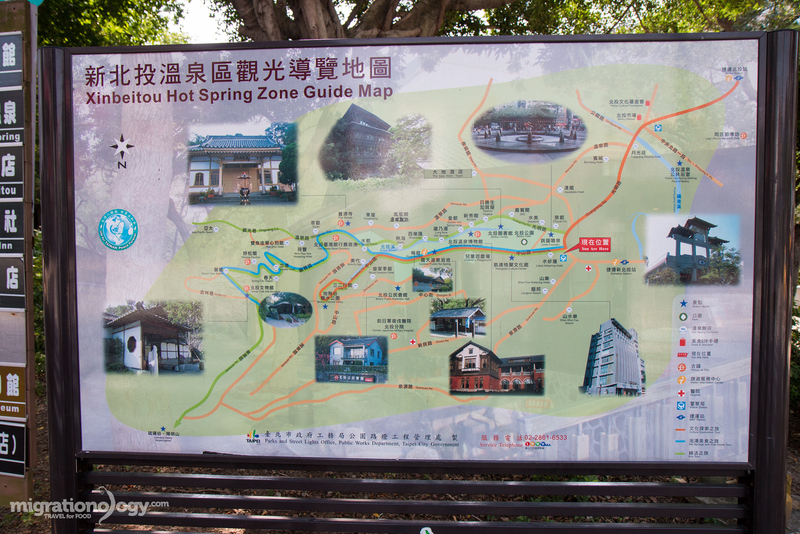 It’s not a huge museum, but it’s worth a visit to learn about the history of the hot springs area in Beitou. Another short walk up the road and we arrived at the Plum Gardens – not an actual garden full of plums – but yet another small museum. 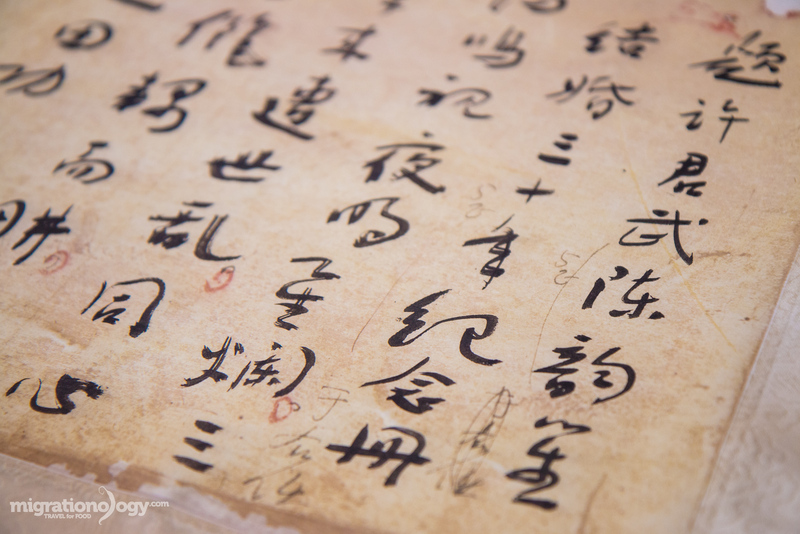 The Plum Garden is the name of the former residence getaway of Yu You-ren, one of the fathers of modern Chinese calligraphy and journalism. 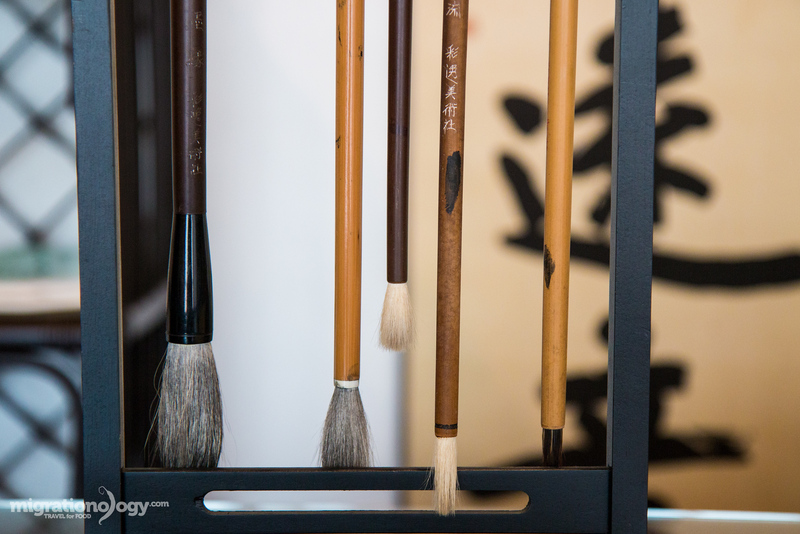 The house is nicely restored, and you can just briefly walk around the house, see some of Yu You-ren famous calligraphy and tools, and admire the architecture of his getaway home. I just wanted to relax at the Plum Garden, drinking hot tea and writing poetry in a notebook and dreaming calligraphy… ok probably more like sit on my laptop with wifi, writing a blog post. But anyway, not too much to see, but worth a visit since you’re at Beitou and it’s free. After browsing through a couple museums in the morning, I was more than ready to soak in the hot springs. 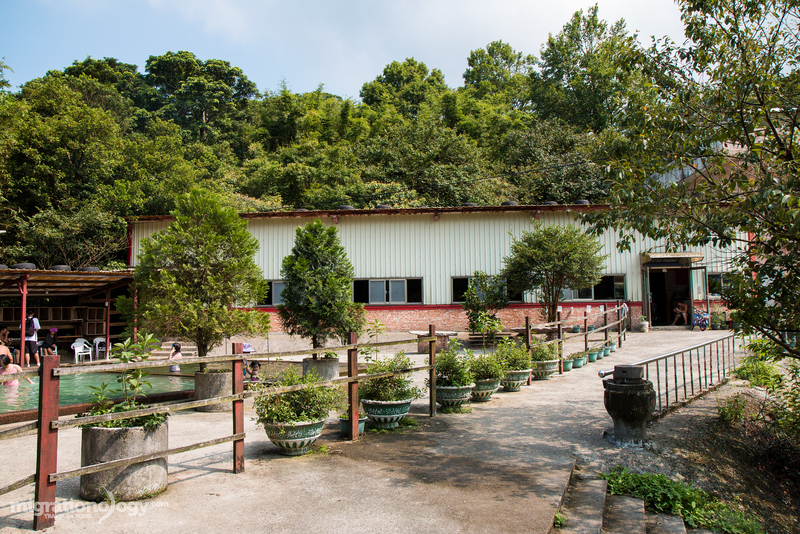 Millennium Hot Springs, located adjacent to the Plum Garden is the main public bath house in Beitou – open and inviting to anyone who wants to experience and enjoy the benefits of the hot spring water, without having to pay for a fancy resort spa. Since it’s a bath house, I couldn’t take any photos or videos once I was inside, so I’ll just quickly explain. The public hot spring pools are outside, still open air, and there are a series of about 4 different pools, each a different temperature, and hotter as you go further up the steps. The bottom one is the coolest and the very top pool is the hottest – and scorching hot! I tried all the pools just for a short time, and the top pool was so hot I could only stay in for a few minutes. The lower pools were really comfortable and very relaxing. It’s a pretty busy place, so it’s not really the type of place you can go and spend too much time, but it’s a good cultural experience to go for a 1/2 hour or an hour or so. One of the most famous tourist attractions at Beitou hot springs, and the landmark sight, is the Thermal Valley, also known as Hell Valley. The Thermal Valley is a jade colored pool of water sunken into a crater that consistently stays boiling hot at a temperature of anywhere from 80 – 100 degrees Celsius (it’s too hot to swim in). As you approach the pool of water you can feel the steam rising from the surface, and if you’re there in the summer months like I was, you’ll immediately start to perspire profusely from the added moisture in the air. The steam does have a sulfuric smell of eggs, but it’s not too bad as other natural hot springs I’ve smelled. The Thermal Valley is the source of hot springs water in the surrounding streams, public bath house, and private hotels and spas in Beitou as well. One of the interesting things about the Thermal Valley is that the water contains radium, a radioactive element that’s said to provide healing elements in the water. One of the reasons I love to travel so much is because you never know what’s going to happen or what’s going to come about. Just as I came out of the hot springs public bath, I met Joe and Raymond who recognized us from our YouTube videos. Raymond’s family is from Taiwan, and so they were visiting for a few weeks and doing all sorts of things around Taiwan during their summer break. We just happened to bump into them. After visiting Beitou, Ying and I planned to just find something for lunch and then head back to Taipei to complete our Beitou day trip. But Joe, Raymond, and his Father, invited us to go along with them through the mountains to another hot spring spot, and then have lunch. We were thankful for the opportunity. I’m not exactly sure where we went, but from Beitou we drove through the beautiful mountains for about 45 minutes until we arrived to a rustic and old-school host spring resort. As soon as we got out of the car and took a peek in the main dining room, I knew it was exactly the type of restaurant I would love. 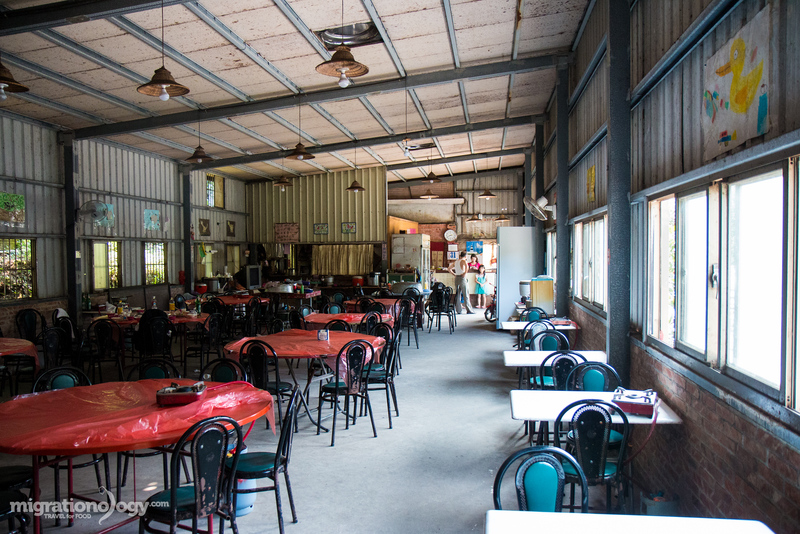 There were big round communal dining tables all packed into what looked like an oversize shed. 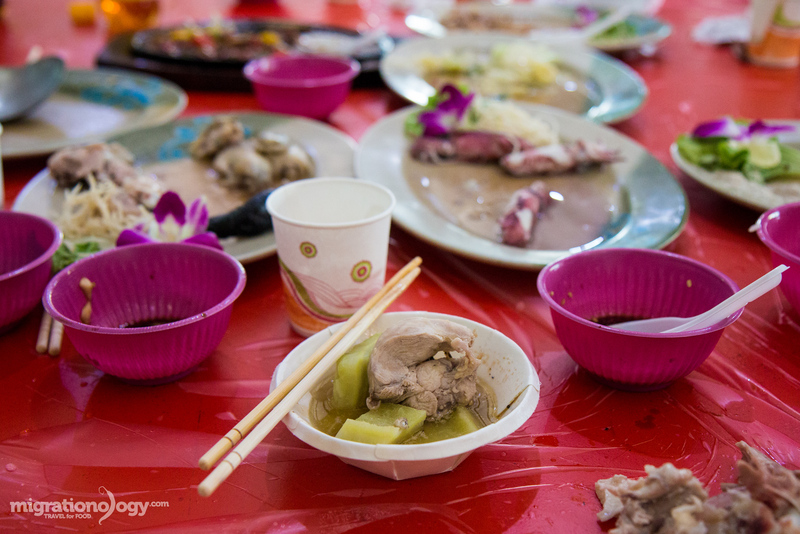 I immediately had flashback of being in mainland China and the family farm feast I loved during my visit years ago. Before doing anything else, we had lunch. Raymond’s Father did all the ordering, and it didn’t take long before our red plastic covered round table was filled with an abundance of fresh proteins. 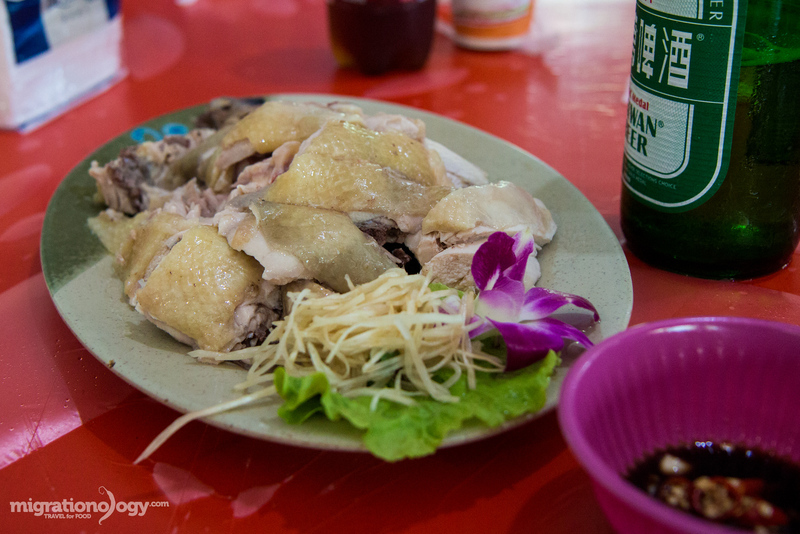 Boiled chicken served cool, with a pile of fresh shredded ginger was the first dish that arrived. It was rustic and country tasting, like real chicken is supposed to taste. I’m not sure exactly which sauce it was meant to go with – normally it would be a scallion oil ginger sauce – but I think this was just served with a chili garlic sauce. It was a great way to begin. 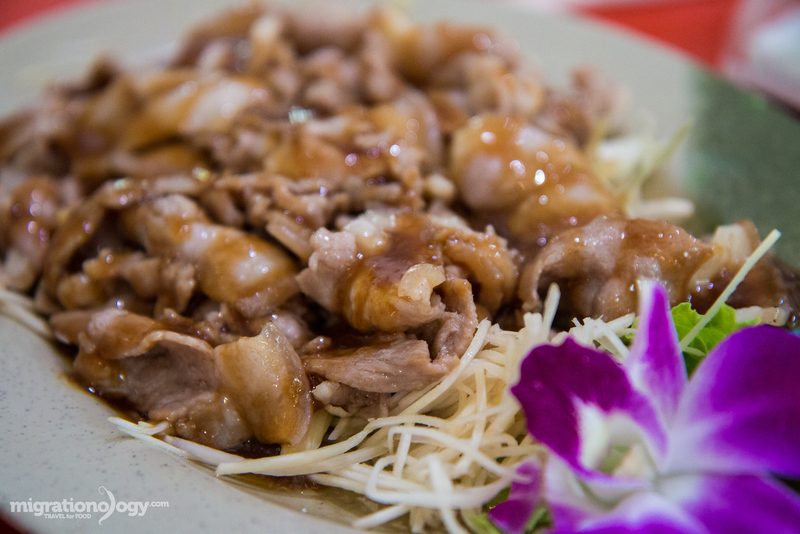 Another dish of this Taiwanese feast I enjoyed was the dish of thinly sliced pork, which I think was pork belly due to its fatty strips, which was perhaps stir fried lightly, topped with oyster sauce, and served with another handful of ginger. The pork had a lovely sour-ish flavor and a nice saltiness from the oyster sauce. 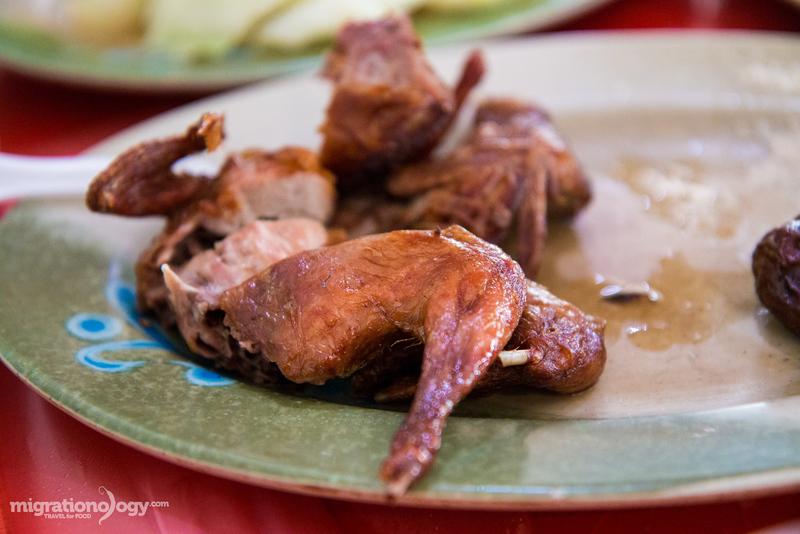 Originally as I was eating it, I thought it was quail, but after posting the video, some mentioned it was pigeon. Whatever bird it was, it was my favorite dish of our meal. The meat was like dark meat chicken, but even more succulent and moist. 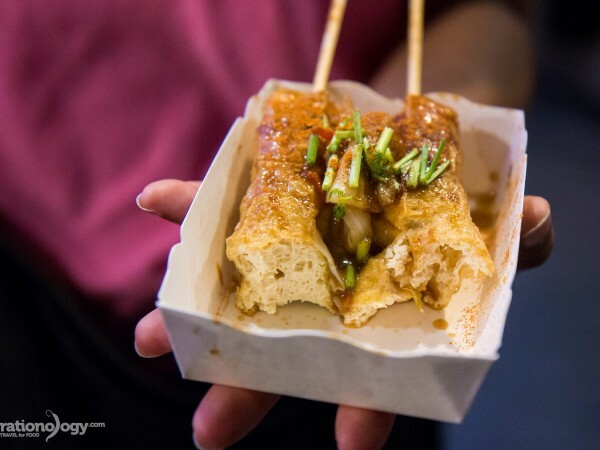 It was deep fried so it had a bit of crispy skin, and then it was served with spiced salt to enhance the flavor. 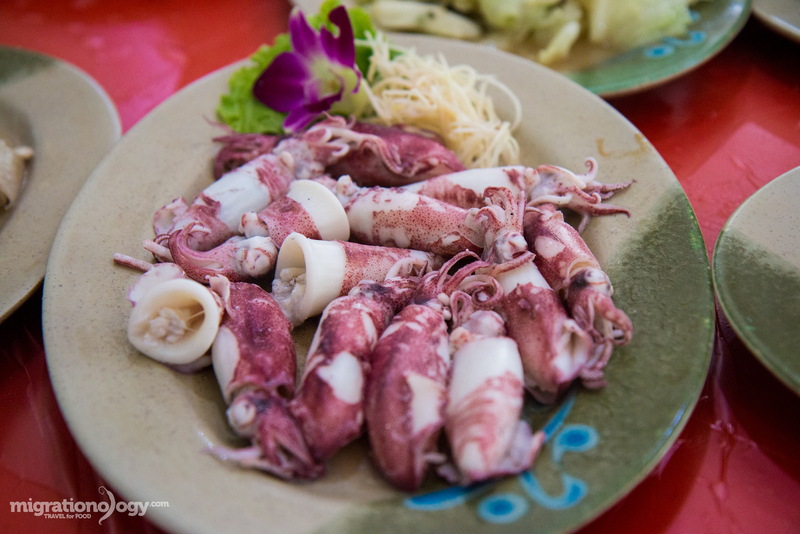 There was also fresh baby squid, another winning dish. I believe it was just lightly boiled, and served with chili garlic sauce. The squid was nice and tender, and really fresh tasting. And then finally, sitting on a burner off the side of our table, there was a full pot of bitter melon chicken soup. Bitter melon is one of my favorite vegetables, and boiled with country tasting chicken, it was delicious and soothing. 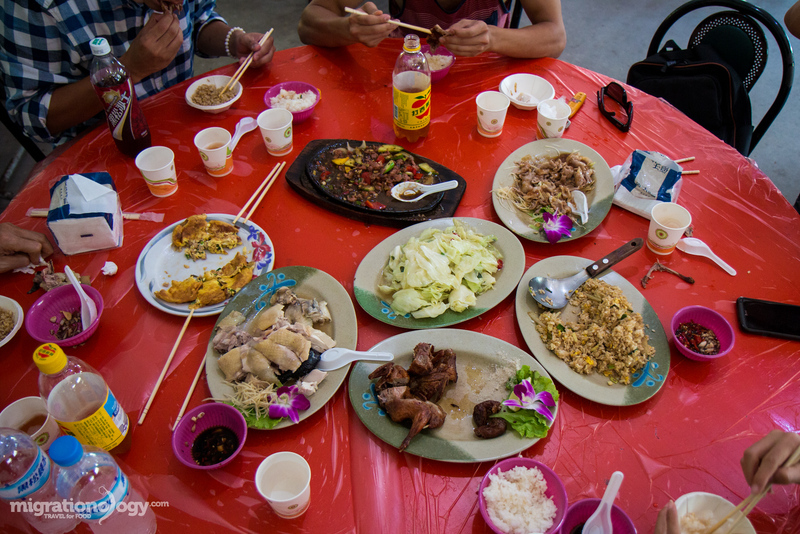 What a Taiwanese feast that was, one of my most memorable meals in Taiwan. Few things in life are better than a feast followed by an opportunity to take a dip in hot spring heated pools of water. Right outside the dining room at this rustic Taiwanese resort were three different temperatures of pools. The one on the far right was scorching hot, the middle was warm and soothing, and the far left was ice cod. We enjoyed the water for about an hour. After lunch, soaking in the hot spring heated pools, and enjoying the scenery of the mountains outside of Taipei, we drove back to the city. Our entire local feast experience and second hot spring resort wouldn’t have been possible without meeting Joe and Raymond, so I want to say a big thank you to both of them, as well as Raymond’s Father. If you have a few minutes, be sure to watch the full video below of our day trip to Beitou, and an unexpected countryside Taiwanese feast! 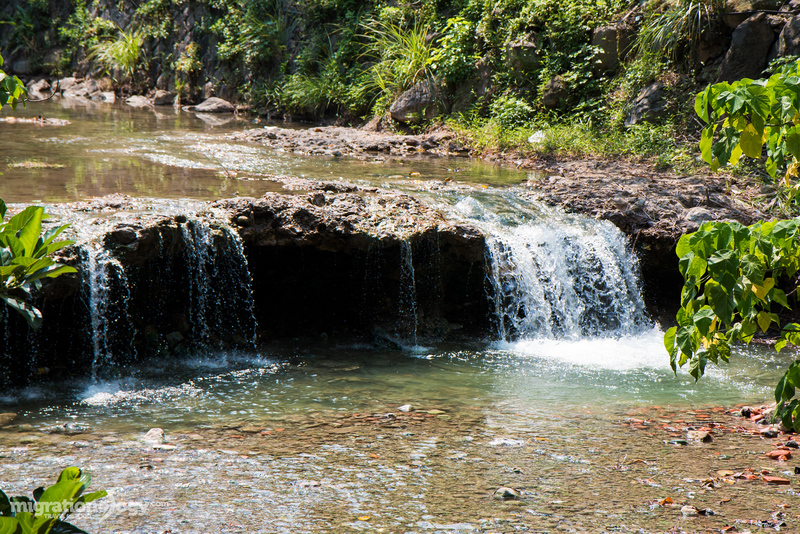 Beitou is an area in Taipei, Taiwan that’s home to natural hot springs. 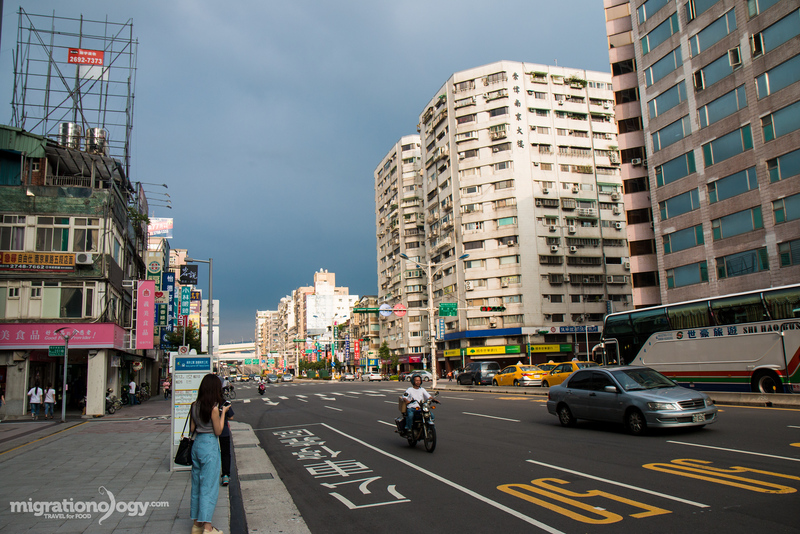 The area was initially developed during the Japanese rule of Taiwan, and today it’s a major tourism destination and a place where many locals from Taipei come to enjoy relaxation and a getaway from the city. 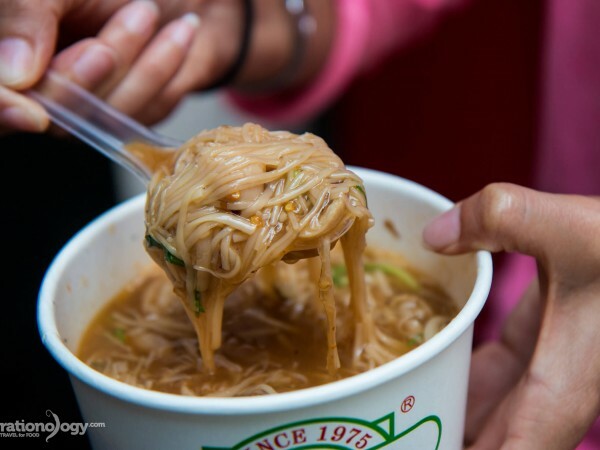 Also check out my Taipei Travel Guide! During our visit to Taipei, we took a day trip to Beitou, went to a number of museums, soaked in the public hot springs bath house, and then had an unexpected Taiwanese country feast to finish off our fantastic day trip. 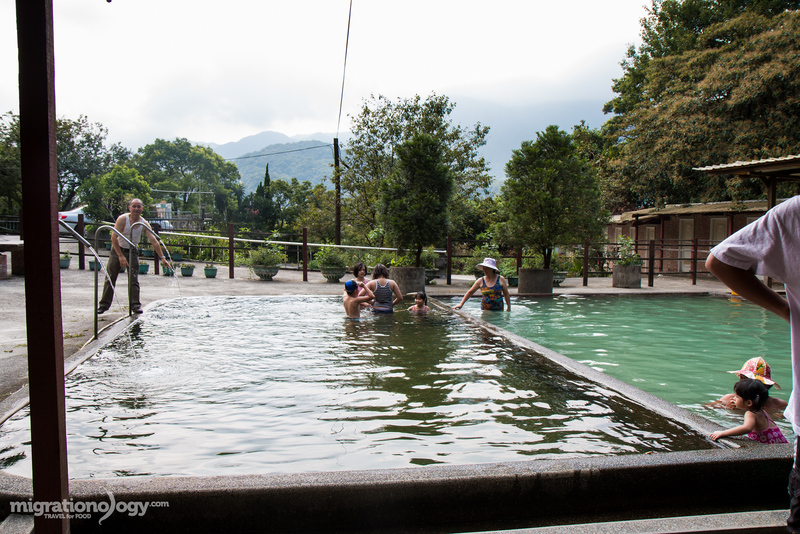 If you visit Taipei, if you find time in between eating at all the night markets, a day trip to the Beitou hot springs are makes a very enjoyable experience. mentioned in your blog. Could u let me know the name of your recommended spa n the restaurant. Thank you. My family and I will be traveling to Taiwan next January. Could you tell me the name of the hot spring resort that was 45 minutes drive through the mountains from Beitou. Would love to try the cuisine there. Thank you in advance and have a fantastic weekend! Hi! This is a very informative post. I will be in Taiwan tomorrow. And, I was wondering if you could help me figure how to get an online booking of entry ticket to this place. Or do you just walk in and buy tickets over the counter? Hey Mark! You have posted such a nice blog, I Am planing a trip to Taiwan, actually a was searching Taiwan’s best place where i can visit, and i found this blog i really like this, thank you for sharing. In 40 days we will spend a week in Taipei for business. But there is one full day off to spend as one would wish to.Love spending time soaking in a hot spring. It was a pleasant surprise to find one of your blogs . Details on how to reach Beitou and an added bonus of other places to visit and do within the area is truly a blessing. Thank you Mark for making it easy for wanderlust to follow your footsteps. Wishing you safe travels and more power! Wow. I love how the hot spring’s temperature changes depending on the location. I went to Onsen in Japan and the hot spring in Banff and it’s nowhere near the heat level I wanted/needed. This sounds like something I would love. I want to try that scorching hot one. That’s amazing! Do you happen to know the temperature for the scorching top one? And the one at the lowest level? We love your blog so much. Because following you, we made also our trip to taipei. Thank you mark for every episode that changed our life. I am travelling to Taipei tomorrow for four days. This blog post comes as just the right pece of information I was looking for Beitou spring. Thanks for sharing. Great to hear that Anand, have an amazing trip! Hi, I’ll be travelling to Taiwan first time ever and will be hopping over to beitou for hot spring, just wondering if the public hot spring pool provides the set of clothing to change or do we bring our own set of clothing for the dip? Great blog! Following your trail as I type this 🙂 thank u! Is there a toilet at the public bath house that we can use after soaking in hot spring? Do you think two hours (or less) would be a good enough time to enjoy Beitou, if my plan is just to take pictures of the place, especially Thermal Valley, and to take a dip in the Millennial Hot Springs? Hey Alec, yes, I think if that’s all the time you have, you can make it a quick trip in 2 hours. Thanks much for this blog post! Super helpful for planning a 1 day itinerary to Beitou! Well written! Hi Celeste, you’re welcome, glad it’s helpful. Hi Mark, what is the name of the hot springs and restaurant you went to in the countryside? Thanks! I’m visiting Taipei for two weeks this December and am so thankful for your detailed and informative guides! Thanks for all the great info about Beitou; it’s definitely on the itinerary. Could you possibly find out where the hot spring resort was in the mountains 45 minutes from Beitou. Thank you . Hi, did you ever get the name of the resort that was 45 minutes away? Cool experience! I think I have been here a few years ago, also taken by friends. It was at night so I don’t know if there were hot springs there, and I suppose there could be many mountain-top places with plastic-covered red tables and country-style food ….but I’m guessing it was the same :). i love this post thankyou for all your tips , this is excellent for a short trip with friends!! I love Beitou. So relaxing that we totally forgot the time and almost missed our flight out of Taiwan! We didn’t get to try the food, but next time we will have to track down that restaurant, looks great. Hi Wai, good to hear from you, haha, that’s a good story – and I can understand how that could happen! May i know the contact details of the private hot spring 45 minutes with authentic lunch served with the package. I love all your Vlogs ! !